Close Encounters With Congress? A congressional candidate in Florida has said she was taken aboard a spaceship when she was 7 years old. She does not mean at Disney World. 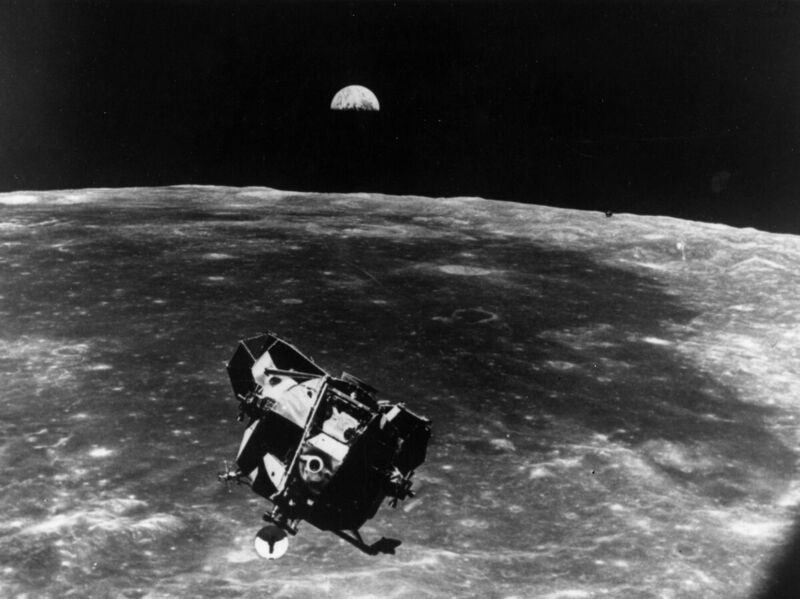 The Apollo 11 space module floating above the moon. Next-generation space queries may tend toward the political: Do the extraterrestrial beings have political action committees? Are there extraterrestrial lobbyists? No indeed. On airplanes these days, you have to pay extra for quartz rocks. Aguilera says she met three beings aboard the ship, two women and a man, all blond and tall, which sounds a little like the Swedish pop group ABBA. She says that their arms were outstretched, like the Christ the Redeemer statue that overlooks Rio, and that the beings have communicated with her ever since, telepathically. Well, that way you avoid roaming charges. When the Miami Herald called the candidate for a statement, Aguilera said a couple of former presidents have claimed to see UFOs, adding, "I join the majority of Americans who believe that there must be intelligent life in the billions of planets and galaxies in the universe." In fact, a 2012 poll by National Geographic and Kelton Research says 36 percent of Americans believe UFOs exist. And 11 percent say they've seen a UFO. Of course, Aguilera's saying she has been aboard a UFO and bantered with the crew is a little more involved than just saying you once saw something unidentifiable glow in the sky. I'm actually impressed that a candidate would acknowledge her contacts with extraterrestrial beings. Many voters say they want candidates from outside the Washington, D.C., bubble. You don't get more outside of that bubble than another planet. A candidate who declares extraterrestrial connections is only being transparent, to use a buzzword of our times. Voters have a right to know: Do the extraterrestrial beings have political action committees? Are there extraterrestrial lobbyists? Do they play golf at a Trump National Golf Club? Are they interested in a free trade agreement with Earth, or do they believe in Alpha Centauri First policies? I'm also concerned that the candidate says aliens visited Earth when she was 7 but haven't been back. Does that mean they came to earth in search of intelligent life but said, "Maybe we better just keep looking?"